Most people’s garages have a ton of wasted potential due to being so cluttered and unorganized. If you’re like most people, your garage probably looks like a storm had taken place there. Thankfully, there is a smart, affordable and clutter-free solution to help you give your garage the appeal that it deserves while storing much more than you thought was possible. Garage storage systems are by far the best solution to such a tragedy and they come in a variety of forms, sizes, styles, features, and sizes that are all guaranteed to solve your chaotic garage mess and help you focus on the things that matter more in life. Despite the fact that solve a big problem, most of these systems aren’t tailored to your specific needs. So, there are so many things that you need to take into consideration before making your purchase. You might also be interested in our articles about the best garage door openers and the best infrared heaters. If you’re new to buying garage storage systems, you probably feel lost and overwhelmed by the endless options. In addition to showing you some of the best garage storage systems that are currently available on the market, this guide will help you pick the one that’s right for you. The following are the top three things that you should keep in mind when you’re buying your garage storage system. Do you need your garage storage system to deposit bikes, tires, or 50 other things? Garage storage systems vary drastically in when it comes to what you can store in them. If you want to store gardening tools, you’ll need a system that’s way different than that used for bikes. If you purchase a 16-bin rack storage system for tires, chances are you’ll end up being very disappointed! The first step is to take a look around your garage and figure out what causes the chaotic look -which shouldn’t be a hard task. After that, you need to choose a system that works best for those items. Difficult? No. Important? Absolutely! Do you know what’s worse than a storage system that doesn’t fit your needs? An overhead storage rack that falls over your head! It’s probably no surprise that a garage storage system that isn’t safe is a very dangerous thing to have around. The material of the garage storage system should also be taken into consideration since. You’ll be storing some heavy things in those systems so a durable material that can survive the wear and tear is a no-brainer. You should also know how strong and overhead storage rack is and how much weight it can hold before you go ahead and throw everything you have in the garage on top of it! Safety factors that need to be taken into consideration are things like corrosion resistance, material, durability and how much weight the system can carry. Having a lot of clutter on the floor that you need to get rid of? A cabinet Storage System would do just that, as it can organize your stuff and keep it hidden and protected. Need to hide clutter while keeping them organized? A bin rack would do just that, and then some. Bin racks are excellent for hiding your stuff while keeping everything with reach. A 16 bin rack storage system provides you with 16 different bins, which you can organize however you like. If you want to really maximize the capacity of your garage then Garage storage shelves are your go-to system! Shelves, by far, offer the most storage capacity by taking things off the floor and layering them on top of each other allowing you to store much more than you thought was possible. Shelves are also by far the cheapest of all Garage Storage Systems. Now that you’re familiar with what makes a good garage storage system and what to keep an eye out for when you’re making your purchase, it’s time to have a look at some of the best models that are currently available on the market. Having lots of clutter that are rarely used and don’t do anything except lie there, ruining your garage and your life? Just throw them on top of the Fleximounts 4×8 overhead garage Storage Rack! 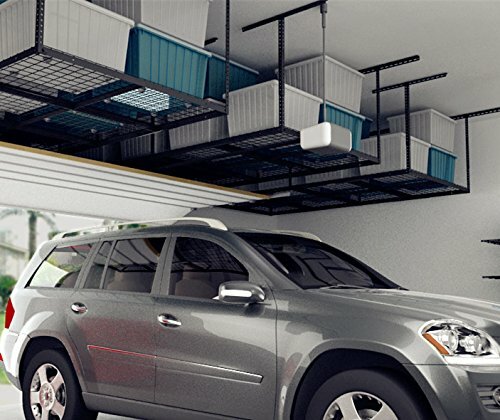 Fleximounts Overhead Garage rack helps you clear your garage and make the best use of space and the same time. 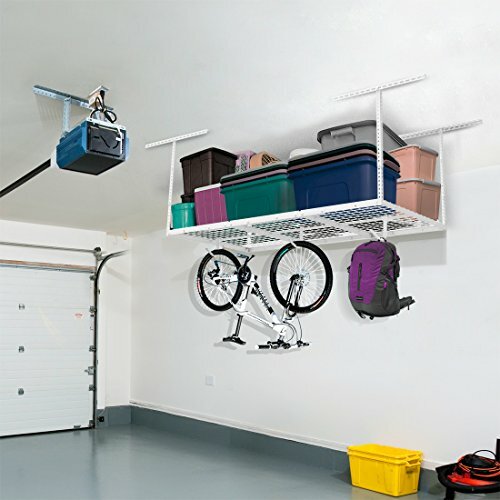 It keeps your garage organized, neat, and your clutter somewhere that wouldn’t bother your eyes every time you see it! Also, this overhead rack is excellent for keeping things out of children’s reach. In addition to that, it protects your items from water damage by keeping them off the ground making it hard for any kind of liquid to reach them. Thanks to its powder-coated steel, this storage system can carry up to 600lbs of whatever you want to throw on top of it. In addition to that, its also adjustable between 22-40 inches of height will give you plenty of safe extra space to store all of your stuff. 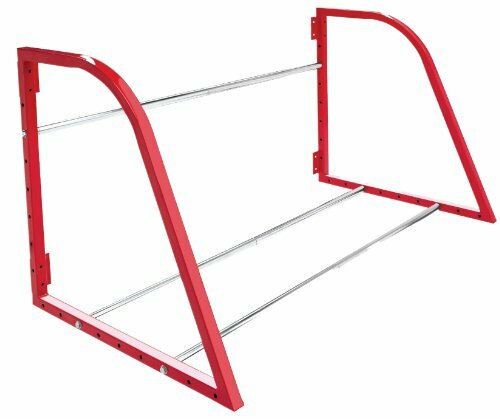 As for safety and quality, this overhead rack is provided with the best combination of brackets, studs and vertical posts that will ensure that this overhead rack won’t be falling over your head anytime soon! The screws and hardware have all been tested thoroughly to ensure the longevity and safety of this product. For the do-it-yourselfers, this overhead rack comes with step-by-step installation instructions for easy and fun installation. Storing tires is in all cases a necessary evil that causes discomfort to almost anyone. Whether you have motorcycle tires, truck tires, SUV, a normal car or you just like to collect tires for the sake of it, storing them will always be a mess to look at and handle, causing more chaos in your garage and making them an uneasy access. Lucky for you, this garage storage system has solved this problem by providing you with an excellent way to store your tires. In addition to making the tires look good in your garage, they are also very accessible. This storage system is made from telescoping chrome tubes allowing you to adjust the system as you desire with enough space to store as much as 4 or more standard size tires, ATV tires, motorcycle tires and many more. The width of chroming tubes ranges from 36 inches to 48 inches, which makes them really durable. Since this Tire-loft is made from strong durable steel it has a capacity of up to 375lbs, which is enough to carry more than 4 tires comfortably. Installing this garage storage system is as easy as it gets. As the installation process is very simple, it shouldn’t take much time at all. All you have to do is attach the two steel end frames of the tire-loft to the wall studs of the garage and you’re good to go. Do you have items that you use a lot but they are a hustle to store? Do you go fishing every week and don’t know where to store your fishing gear? Do you have boxes, large tools, snow blowers or even tires that you want out of the way but with easy access? This garage storage system has got you covered. This system uses a pulley system built in a way that requires close to zero effort from your side, making storing and using easy, smooth and fast. Just throw the things you want to store for now on the rack, use the effortless-pulley system and you’re done, it’s that simple. The rack of this Storage System is 4-by-4 foot, which allows you to store your fishing gear or put your tires or boxes up there. If you have anything that you don’t need, just throw it on top of the rack and you’re done. Asides from its 4-by-4 foot area it can store as much as 250 pounds high above ground level saving a lot of space from your garage’s ground, keeping your storage safe and making it easily accessible. As for safety, this garage storage system has an excellent safety lock. When the rack is raised to the ceiling, it will stay at the ceiling. All you have to do is use the winding crank to engage the safety lock and make sure that no unfortunate accidents would take place. If you’re the kind of person who has lots of tools in his garage, then you’ll fall in love with this pegboard with its innovative pegs that accept anything ranging from hooks and brackets to shelves. This Garage Storage System definitely stands out as a must-have on our list and doesn’t fail to impress. The metallic galvanized finish of this pegboard, along with its black accessories are nothing short of impressive. Just throw yourself a driller, a few hammers, and screwdrivers on top of it and you have yourself an art show. This system has everything that you’d normally expect from a top-notch garage storage system. Asides from having magnetic panels, it also has a rust-resistance finish for extra protection. It is also worth mentioning that the steel prevents the holes from wearing guaranteeing the longevity and durability of this Storage System. When it comes to upgrading your pegboard, don’t worry you won’t be limited to the accessories that come with your pegboard only, since this pegboard accepts all conventional 1/4 inch pegboard pegs. It’s also worth mentioning that any pegboard pegs produced by wall control will be completely compatible with this pegboard. If you ever have an urge to upgrade your pegboard hooks at once or one hook at a time, this one is definitely an excellent choice. 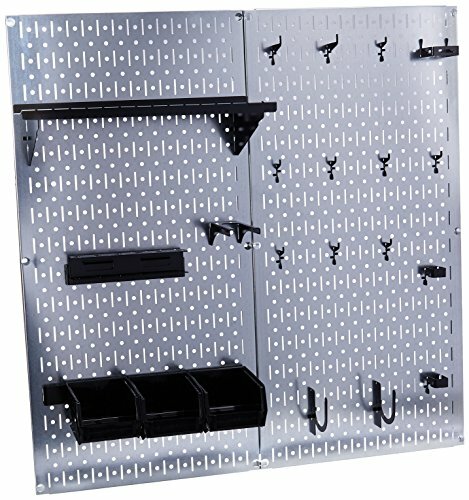 As for durability, the wall control pegboard is designed with a rust-resistant finish and wear resistant holes, it is also over 10 times stronger than normal pegboards, all which guarantee the longevity of this pegboard. As for safety, the patented double offset hook engagement will make your hooks as stable as it gets, ensuring a stable, secure storage for your beloved items. If you want your things kept together in a neat, organized and labeled way, this 16-bin rack storage system will do just that. This is a garage storage system should be present in every garage for its convenience, simplicity and it’s diversity of applications, having one of those bins will make your garage at least 10 times more organized. 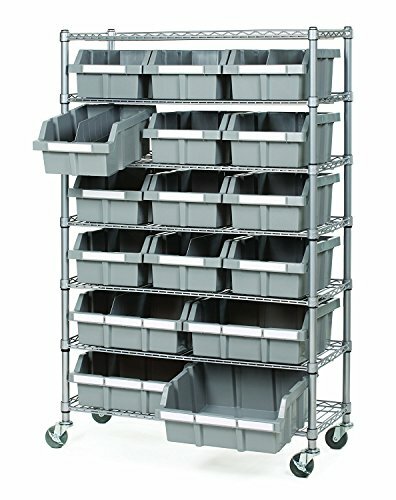 This rack has 16 sliding bins that would not say no to anything that you store into them. You can store anything from tools to helmets in with this system. It has 12 large bins and 4 extra-large bins if you want to place bigger items. This kit also includes 16 bin labels because there are a lot of them you might just get lost! And it doesn’t stop there the kit also includes 4 bin dividers to have different sections inside each bin, which is really handy. For example, you might want to divide a single bin into 2 sections, one for big nails and the other for smaller ones. The options with those bins are virtually limitless, and you can play around with them as much as you want. It’s also worth mentioning that the rack is provided with tires in order to facilitate movement, so if you want to transfer the rack from one place to another or take it for a walk around the neighborhood, that shouldn’t be a problem. This Storage System also ranks high on safety as it is provided with platinum epoxy protection which resists corrosion and ensures that your bins stay healthy and in good shape for the longest time possible. In addition, the shelves are certified to NSF/ANSI Standard 2 – food equipment, making them optimum for almost any usage and able to store up to 150lbs per shelf without breaking a sweat! For bike lovers having one bike is simply not enough, but bikes become a real pain to store and they take up a lot of space. Thankfully this garage storage system takes care of this problem by allowing you to store your bikes over-head so you never have to say no to a new bike! This system is extra cautious towards the well-being of your bikes so they designed their hooks with rubber coatings to prevent any sort of unwanted scratches. In addition to that, they also provide you with extra smooth pulleys to make lifting the heaviest bikes as easy as it gets. When it comes to heavy bikes, the powerful engineering of this hoist allows it to stand tall in the face of the heaviest bikes with a lifting capacity that’s up to 100lbs. In addition to bikes, this system is also great for storing other kinds of things by hanging them, which is practical and looks awesome as well. 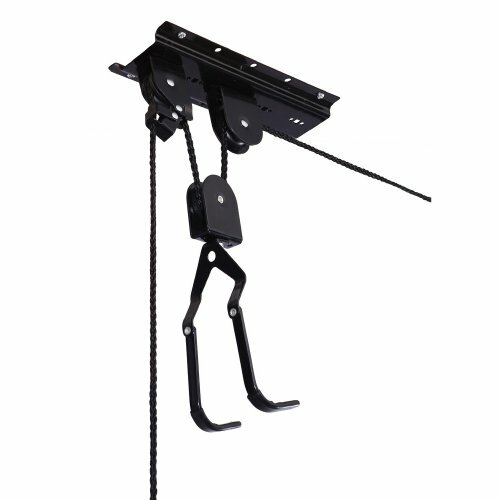 Since all over-head Storage Systems need to have exceptional safety and durability, this hoist comes with a rope locking mechanism to prevent any “flying bicycles” from ruining your day! If you want to store pipes, shelves, or any similar object in your garage, this is hands down a storage system that you should consider. Storing shelves and pipes isn’t an easy task. However, with this system has got it covered in a way that’s easy, affordable and adds more character to your garage. Storing lumber is also super-convenient with this system. As it gives you 39 inches off the ground space, it allows you to keep objects horizontally on top of each other, giving you more space to work with. With its 5 different storage levels that are 6 inches apart, you won’t have any trouble depositing the thickest of objects between those shelves. If by chance you wanted to store a massive load of pipes on just one shelf, the pegs can be easily removed to add height as much as your heart desires. Want an extra shelf to store things on top of? Just put a board on it and you’ve got yourself a solid shelf with durability up to 100lbs for each shelf allowing you to deposit the heaviest object with ease. 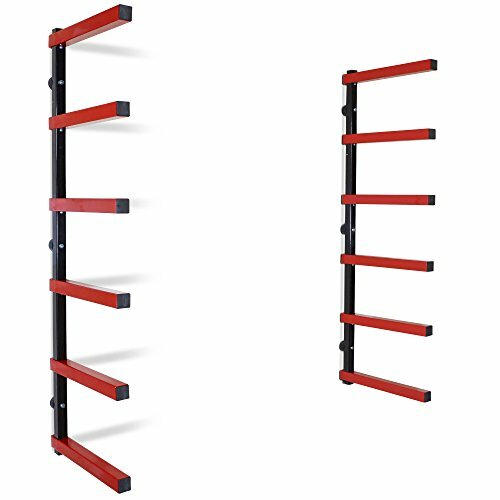 This rack is also effortless to install so getting it up and ready should be an effortless task that requires an average skill level. This overhead Garage Storage Rack is another great product from Fleximounts that you should consider if you want to go for a smaller overhead rack, which is also capable of storing a lot of your seasonal items in a smaller space. For some, a 4×8 overhead rack may be too big a rack for your garage or your pocket! Fleximounts have solved this problem by providing you with a smaller solution for both. Despite its small size, this rack is constructed of cold-rolled steel. This gives it an exceptional storage capacity of 450lbs, making it a subtle, affordable solution for people with small garages who don’t like a hanging storage system. The height of the rack is also adjustable ranging from 22 inches to 40 inches, giving a lot of space to play with. 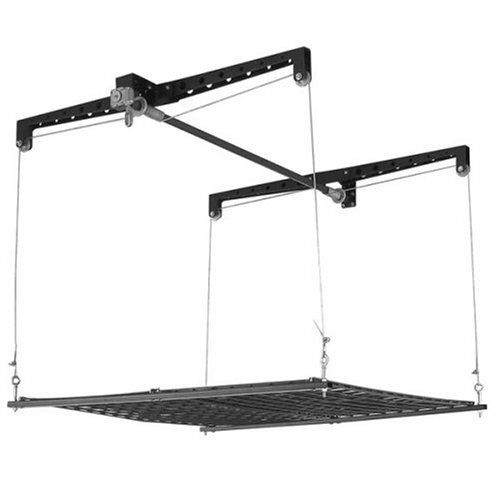 When it comes to safety, Fleximounts ranks high on durability and safety on all of its products, coming with high-quality screws this overhead storage rack is guaranteed to stand the test of time, and last a lifetime.